People have always had a bad habit of defining themselves by likes. The world of social networking has made that desire worse. Some go to the extreme of creating fake lives and persona’s in the hope of gaining affection. Don’t forget to be who you are. You are worth all the likes in the world, whether you get it or not. 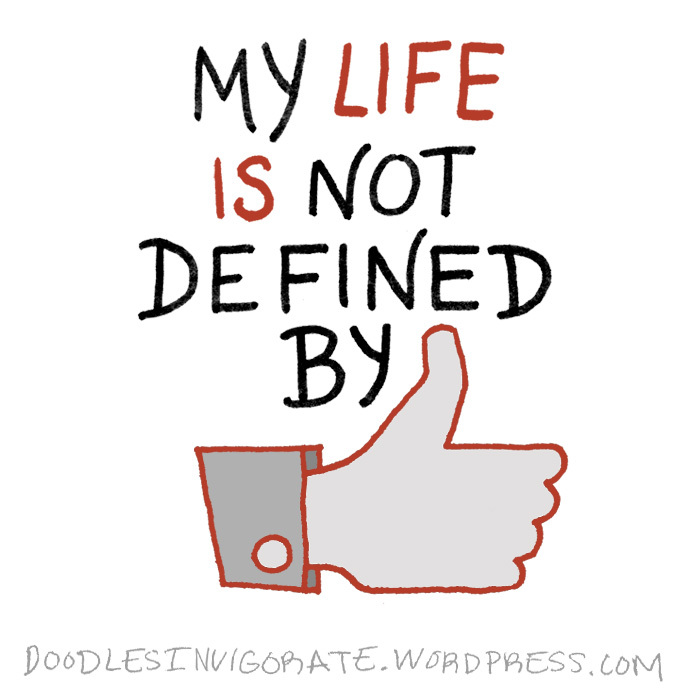 My life is not defined by likes! Hope it’s OK to like the post! Does it defeat the point of the post, if I like it?! This should be shared with all young people. If you read this and agree reblog it, I did! I totally agree with this. I encouraged my followers to reblog it. I hope you don’t mind. I know I am doing more things right for life around me, when the mass’s don’t LIKE what I am saying or doing. Because the world that is defined by the MAJORITY RULING has obviously not seen what they LIKE to support…which is the separation of humanity and the division of all life and creatures on this planet, they support POVERTY and WAR created to make money and control people and all natural recourses for power and profit for their corporations and organizations. It is the Minority that believes in peace and equality and does not need anyone’s approval to do what’s right for the world around them, they do not need a trophy. awards, plaques, a medals, or money or any other incentive to be encouraged to do what’s right for life around them. Nicely said! I should have let you write this post! Indeed, the corruption of society and the world is sad on many levels. But there are some rays of light out there which is very reassuring. I am always hopeful that one day the minority, who is fighting for love, peace and good will for all mankind, will rise up. I feel sort of odd clicking Like now, but I’m going to because well, I do. 🙂 A few others said the same. I like this post…totally agree. We see approval from others rather than forgiveness from Him. Good post, particularly in this day. We should fellowship with other believers. We must learn to give love without expectation of reward. Then we shall have no reason to worry about being liked. Amen. My favorite part of that scripture is, “not neglecting to meet together”. Being able to connect on devices has taken away a lot of peoples desire to meet together in person. We still need to gather together and encourage face to face. A ‘Like’ could actually boost your pride… and we all know pride comes before a fall. Very true. That is a struggle for me. I have to remind myself to stay humble. Amen! May the Lord bless you by keeping you humble. As I seem to be “travelling” the internet and reading what other people are writing or in your case doodling, I am so encouraged. Why? Because there are many people “out there” who are willing to make a difference by writing and posting their thoughts. If more and more people choose to follow peace, harmony but still look after those who may not be able to look after themselves, the world WILL change. It has too! It all starts with us. Hey Gale! Yes it is beautiful to be able to read encouraging thoughts. My greatest wish is that people will do just as you said, follow peace and look after others. Thanks for sharing!